Aug. 10, 2016 – The killing of three rare Kordofan giraffes inspired a filmmaker to transform his anger into action. David Hamlin was on assignment in the Democratic Republic of the Congo when he saw a female and two male giraffes peacefully making their way through the tall grass. The next morning he learned that the three animals were found shot and mutilated. Shocked by the news and compelled to uncover the truth, Hamlin decided to visit the site of the killings to document this horrific act. Accompanied by armed rangers from the nonprofit conservation organization African Parks and the Congolese Parks Authority ICCN, he ventured through the volatile grounds of Garamba National Park. There he learned that the giraffes were killed for something worth thousands of U.S. dollars: their tails. 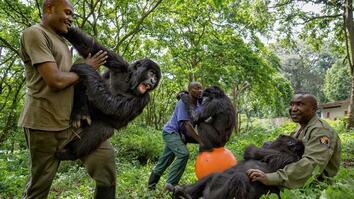 Garamba National Park is a battleground where heavily armed groups poach wildlife for resources and monetary gain. This latest incident was a major blow to the rangers, because the number for Kordofan giraffes in that area has dwindled down to 37. However, Hamlin hopes this tragedy will galvanize the efforts of conservationists and others who fight to protect the world’s endangered animals. 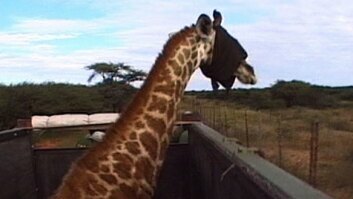 Read more about these giraffes' death on NG News. Learn more about African Parks’ work in protecting Africa’s national parks. Learn about the efforts to protect Africa’s giraffes. Seeing these giraffes from the air was really exciting. Seeing them anywhere was exciting because there are so few of them left. But this was my first shot, and there’s a giraffe standing in this small clearing by a small tree. And then the next thing I know there’s three. The next morning, I was informed that about twelve hours after we’d seen these giraffes there was a ranger patrol in the area that heard ten gunshots. It was too late for them to follow the shots to find out where they were. They waited until the next morning, they went in the direction of the shots and, lo and behold, they found three dead giraffes in the area that we had been in. Helicopter SOT: Okay, here’s one carcass. Ranger SOT: The [expletive] sakes. [Expletive] bastards. [Expletive] bastards! That was horrible. It was horrible for them. It was horrible for me and the team. And the crushing realization that its, most likely it was these guys, these ones that we’ve seen. Um, and now there’s three less. Now there’s thirty-seven [giraffes left]. It was really awful. 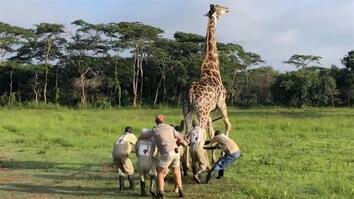 I was working in a very remote, iconic national park called Garamba National Park. Garamba’s a park that run by ICCN, the Congolese government in association with African Parks, and organization that’s responsible for the management of the park and the wildlife. It’s a very challenging environment on the Congolese and Sudan border. The first thing you have do is secure the perimeter. This is the frontlines of the poaching crisis with a terrorist network and highly-militarized forces surrounding us in every direction. This is tough environment. Look how high this grass is. Patrolling these grounds, you’re always at risk of an ambush. When you approach these animals through the tall grass, even though you can’t see yet you know that you’re getting close to the carcasses because of the sound of the flies just starts growing, and growing, and growing. [Translated from French]: For us it’s really chaotic because in the Garamba National Park, the remaining rare species nowadays are now the giraffes and the elephants. In 2015, we didn’t see or find carcasses of giraffes. But since this year 2016, we have seen so far four carcasses of giraffes. Sadly in my career I’ve seen poached elephants before at multiple stages of decay. But I’ve never seen a giraffe. Who kills a giraffe, you know? Um, it was awful. Because of their size and their exquisite form they take a particularly grotesque appearance when they’re lying down contorted on the ground. This is a bull. We’ll walk over to that carcass. That’s a lot small carcass. Let’s go and see what that is. That might be a female. This is a tragedy of epic proportions for this species, Kordofan giraffe, a unique subspecies. These are the last ones left in the entire region. The sad part [is] this is a female. Every single female that we lose is a breeding female that can produce more. On further examination there’s also things you notice immediately which is they didn’t take any of the meat. All that they did take is the tail. We can now clearly see what, what happened. I thing they were probably all shot at the same time. The first one in the brain. The other one dropped right next to the first one. And this one was shot multiple times as it was running away. You can see some shots next to the spine on the left and some shots from behind under the tail. This giraffe carcass is only thirty-six hours old. What happened here was the poachers—you can see where somebody cut this open with a knife. So the poachers cut this open to give access to the vultures so that the vultures can finish the carcass in two days and we can’t detect the carcass from the vultures. The longer the vultures stay around, the long we have to detect it. So this one was the one that was collared. This was a giraffe that had a satellite collar on. That was crushing for the African Parks and Garamba team that was with us because this is critical data that they’ve now lost. Just our normal anti-poaching strategy is obviously not working. This giraffe bull was collared. We’ve got collars on all of our giraffe groups to know where these groups are at all times so that we can follow them, we can shadow them and we can protect them. And we’re still failing. We’ve got five groups of poachers coming in here. Unidentified helicopters. We’ve got guys coming from the north, the LRA who are only after elephants [that] they need to fund their war. But then we got the North Sudanese, the Janjaweed. The North Sudanese has got a market for bush meat, they’ve got a bunch of refugee camps, they’re protein starved and they would take the meat. The Congolese people don’t touch the meat. They believe they’d get leprosy from eating giraffe meat. They only cut the tail and they would use that tail as a dowry to the bride’s father if they want to ask for the hand of a bride. So having the tails cut only probably indicates that these were Congolese poachers. Just the very little tip of it—the long black hairs that are used as flyswatter—it’s worth thousands of U.S. dollars. The sad part about the history of Garamba is that we’ve lost the Northern White Rhino and we’re now about to lose the last giraffe if we don’t get our act together and stop this poaching. Here is a purely military task. We’re not after groups of two or three guys ducking in by night to a run and getting out again. We’re after heavily militarized, heavily armed groups with a specific directive: come in, off take resources, get out. [Sighs] Every one of these we find is just one more incentive, one more push just to go a bit harder, a bit further. It will never cease. [Translated from French]: Even if they are determined to kill all our animals and also kill all of us, we are committed to fight them and this situation will not discourage us or push us to stop fighting against the poaching in the Garamba National Park so we will continue sacrificing ourselves for these animals. It moved me to tears when I was out there. It’s brought be to tears again sitting here. It’s really forcing me to reflect on this experience. I’ll never forget it. I’ll never stop being angry. I’ll never stop feeling [sighs] a duty to continue. But I also feel tremendously obligated to bring it back and try to utilize the resources and the awareness that only National Geographic can provide. You have to turn tragedy into a galvanizing force. We have to turn tragedy into activism. Alert the world to the tragedy of what happened that day and find a new way to let it live on as a source of energy and momentum for all of us.